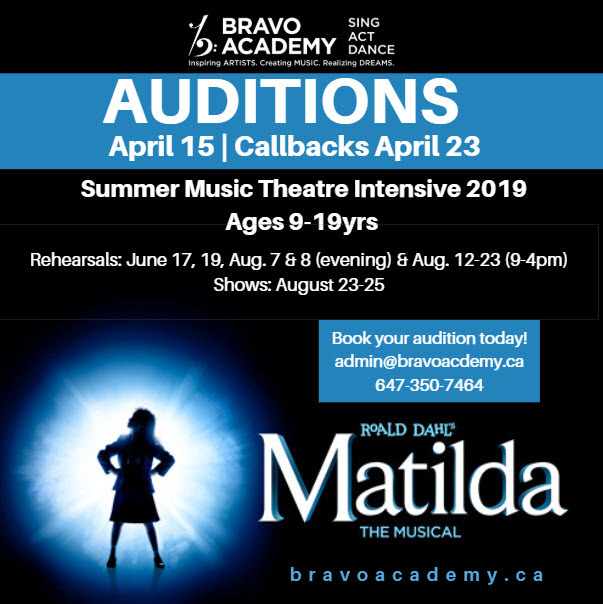 Our 2019 Summer Music Theatre Intensive is Roald Dahl’s MATILDA! Inspired by the twisted genius of Roald Dahl, the Tony Award-winning Roald Dahl’s Matilda The Musical is the captivating masterpiece from the Royal Shakespeare Company that revels in the anarchy of childhood, the power of imagination and the inspiring story of a girl who dreams of a better life. With book by Dennis Kelly and original songs by Tim Minchin, Matilda has won 47 international awards and continues to thrill sold-out audiences of all ages around the world. This program will accept students ages 9 to 19 for an intensive two-week rehearsal process, directed by top industry professionals and culminating in professionally-designed performances at our Bravo Academy Zlotnik Studio Theatre.